The People Want a Death Star! My first thought was about my students who would test advanced proficient in Star Wars trivia, yet claim American history is too confusing, boring, unimportant. I thought of students who quickly accept anything that appears at the top of Google as "fact," yet are quick to point out where to find accurate information on the celebrity of choice. I also thought of students who have little interest in learning the basic technology skills needed to function in society, yet have no issue spending hours, days even, beating the latest product developed for Xbox. I thought about how they would gladly add their name, proudly telling everyone they signed a petition to make the US government discuss the possibility of a Death Star in our universe. The Death Star. The planet-sized instrument of destruction, powerful enough to destroy entire planets with a single blast. A tool developed by the Empire to instill fear and command compliance. 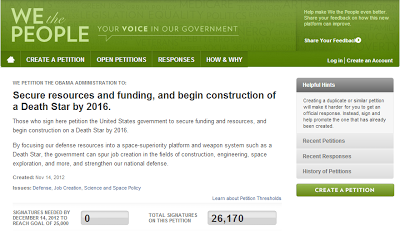 More than 26,000 people would like to see construction begin 4 years from now. Through the power of social networking sites like reddit, digg, 4chan, Twitter and Facebook, people learned about this petition and took the time to create an account to add their name. One man's idea spread by others, eventually convincing more than 26,000 to sign their name. The name "Death Star" does not necessarily evoke ideas of safety, protection or peace. What is their real motivation? A project of that scale would be an incredible cost; we are having difficulty paying the bills as they are now. How will adding such a large satellite impact the Earth? Our current ability to move people and supplies to the work site is inadequate. Where are the supplies going to come from? How do you mine and process enough materials to build a planet? How will the workers be housed? supplied? cared for? paid? The Death Star. Instrument of destruction. Did you see the movies? Are we admitting that we aren't the good guys? That we would have sided with the Empire? Is this about Jar Jar Binks? Consider taking a few minutes to discuss this current events topic with your students. Most of your students have seen Star Wars. Building on that knowledge, this little story provides an opportunity to introduce discussions on topics such as social media, political action, local/global/digital citizenship, and the impact of celebrity/entertainment on society. History classes can discuss how societies in the past faced and dealt with a Death Star-like decision. Math classes can discuss the geometry and costs related to such a building project. Science classes can discuss the challenges of building in space and the impact of large satellites on the planets they orbit. Literature classes can discuss the impact of stories on the real world.